Traveling Bee Venom Therapist serving North America for the relief of symptoms from: Arthritis, Bursitis, Tendinitis, Lyme Disease, M.S., and other spinal, neural, or musculo-skeletal ailments. An Alternative Remedy for MS that really works! It was reported in the December 2005 issue of the Townsend Letter for Doctors & Patients (www.townsendletter.com) that there is an alternative remedy for MS that is helping hundreds of patients formerly resigned to the hopeless regimen of drugs and injections offered by neurology doctors. It can be found in the article “Multiple Sclerosis … A Cure in Search of Doctors,” by Dale Humpherys. Dale Humpherys is a patient whose MS has been in “remission” for more than 30 years. For that length of time, he has followed a protocol established by Dr. Frederich Klenner of Reidsville, North Carolina that requires daily intramuscular injections of vitamin B1 and liver extract, oral vitamins, and a high protein diet which is required to rebuild the myelin sheath. It took two years for Mr. Humpherys to put his MS in remission forever, and it has taken a similar amount of time for other MS patients to achieve success following Dr. Klenner’s protocol, even if they are wheelchair bound. With the presence of neurotransmitters in bee venom, bee venom therapy may hasten the repair and healing of damaged nerve fiber on a faster time frame for one following the Klenner treatment, but it is certainly not required. To date (October, 2006), I know of a few individuals who have already achieved faster healing by using both therapies. In developing this protocol, Dr. Klenner made an amazing discovery about MS. He found that it is not an autoimmune disease where the immune system attacks itself. It is caused by a vitamin and nutrient deficiency which initiates a viral inflammation that causes the myelin sheath to erode. Correct this deficiency and the viral inflammation abates, thus, allowing the myelin sheath to heal. No wonder ABC drugs and Interferon injections don’t work as part of a neurology protocol. They’re treating the wrong condition! More details about Dr. Klenner’s complete protocol can be found at the website above, but if anyone has trouble finding Dale Humphery’s article, or the Klenner protocol, they should contact me. P.S. Since I added this section about the Klenner Protocol to my website, I have found another potential cause of MS in other people. 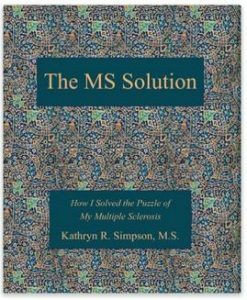 Kathryn Simpson has written an invaluable book, The MS Solution, which details her experiences in getting her MS to go into a remittive state. As a clinical researcher, she was able to pull all the science together that showed how her MS was being caused by hormone deficiencies, and that the way to correct this problem was through bio-identical hormones, frequently applied by patches. Two of my clients, who tested positive for hormone deficiencies with their doctors in a simple blood test, have followed this hormone protocol as described in her book. They both began to see improvements within a month. At this time, they show continued progress with each month that goes by. Kathryn Simpson’s research also indicated that hormone deficiencies can be responsible for other neuro-degenerative diseases like rheumatoid arthritis, fibromyalgia, and ALS, so it makes sense to check for this with these types of ailments, too. © Copyright 2016 Bee Well Therapy, Inc.